On August 4th 2012, our beautiful son Eli came in to this world. 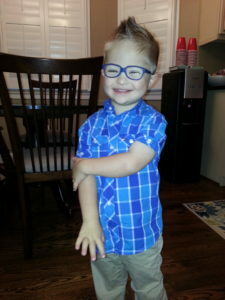 Two days after Eli was born, doctors announced they suspected Eli had Down syndrome (Ds.) Hours later the doctors confirmed Eli also had Congestive Heart Failure, a common diagnosis in children with Ds. We were told that for Eli to live, he would need open heart surgery before he was 6 months old. Eli struggled to feed and struggled to grow, but he woke up smiling every day and never cried a tear. At just 10 weeks old Eli began physical therapy and speech therapy services, both to help him gain strength and combat physical issues common to little ones with Ds. Even at his young age, we could see Eli was a fighter and the hardest worker we’d ever met. 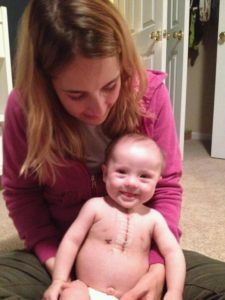 We spent the first four months of Eli’s life working to keep our happy little boy alive and researching where we would take him for his heart surgery. We elected to go to the Children’s Hospital of Philadelphia (CHOP), one of the leading pediatric cardiology facilities in the world, and just three hours from our home in Virginia. Our cardiologist told us to prepare to spend 10 days in Philadelphia, but this did not sway our decision to travel 180 miles to the best possible facility for care. 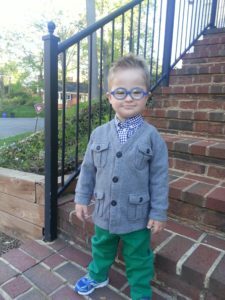 Eli was admitted to CHOP on December 21st, surrounded by his parents and a swarm of loving grandparents, aunts and uncles. On the third day following Eli’s procedure, his surgeon told us it was time to go home. Our little boy had done it – he’d survived the surgery and was thriving. Having Eli released from the hospital on his first Christmas Eve, there is no greater gift we could ever receive. In just our short time at CHOP, we realized very quickly how blessed we were to have made the journey without worry of financial hardship. We met family after family who had been in Philadelphia for extended periods and were struggling financially. Oftentimes one parent had quit a job to be near their ill child, while a second parent remained home juggling a job and other children. Balancing double living expenses on one income was well beyond the means of many people we met. 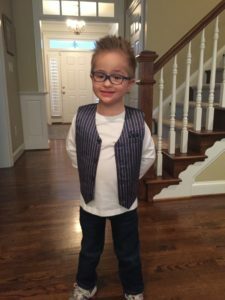 Since his heart surgery, Eli has flourished and grown in to a remarkable little boy. To this day, Eli wakes up smiling and goes to bed smiling. He is kind and smart, empathetic and compassionate, a persistent and hard worker and truly, truly the funniest kid we know. Life is filled with challenges for Eli, and yet he manages through every single one with the most positive attitude and desire to succeed. He is our hero. When Eli was born we weren’t quite prepared for all the surprises he had in store for us, but we know this little boy came in to the world simply to make it a better place. It is through Eli’s Heart that our little fighter is already changing lives for families battling financial struggles in their most difficult and dark time. Eli, from the bottom of our hearts, we thank you for being you, lovebug.